Here is my contribution to Laura’s Literary Lion prompt. I had one for last week (“water”) but it was complete pants quite frankly, and I didn’t have time to make it less pants :-). This week’s prompt word, kindly supplied by the Literary Lion, is “dance”. 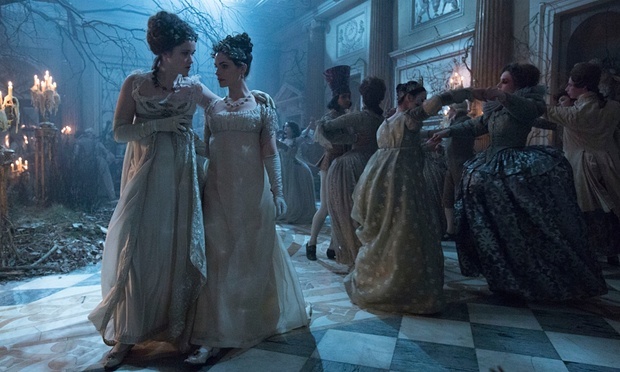 The picture I have used was taken from The Guardian, but the same picture was on multiple websites so it’s likely a publicity shot (from “Jonathan Strange & Mr Norrell”) and owned by the BBC. Mirabelle whirled amongst the dancers, her feet a blur. Her head swam and her heart pounded as she swirled around and around the Hall. The Lord had wooed her, told her she was pretty and invited her to the Hall. For a poor peasant girl, this was a dream come true! The Lord of the Dance watched the mass of unwilling dancers with an appraising eye. As one flagged, he moved in and touched their shoulder. A moment of agonising pain and then, magically revitalised, they would dance renewed. But each time, the renewal faded more quickly. Mirabelle had witnessed the end of the cycle – a girl spasming, helpless on the floor, froth pouring from her mouth. The Lord, uncaring, stepping over to snap her neck. This would be Mirabelle’s fate – already she had danced… two weeks? Three? How was she to keep time in this nightmare? As she whirled, she longed for death, an end to this travesty of joyful dance. She no longer cared, just wanted this to end. Garett, concealed on the balcony above, watched the dance, horror reflected in his eyes. He’d long suspected that the Lord of the Dance was of the Elder Folk. He’d known The Lord was cruel, but this? It was too late for his beloved. He’d watched the Lord snap his darling Jenna’s neck when he had no more use for her. She would be the last, he determined. Holding the Medallion of Akros in one hand and raising the other above his head, he drew a deep breath, ran over the spell one last time, and began to chant. I wondered what happened to you last week, but here’s a merry return… Not where I expected the tale to go at all, but I loved the twist, some sort of macabre fairytale. I could see it on film. It’s annoying to write a whole story and not publish it, but I’ve been so busy at work (where I spend 10 hours staring at a computer monitor) sometimes I can’t bring myself to look at another monitor when I get home. Ooh I feel your pain, I mustn’t moan but I write all day for a living, so sometimes writing after or between work for my blog is a struggle! Maybe keep the other story on the back burner, it’ll probably fit another prompt one day soon, they often interlink. Although saying that I do write things all the time that get binned, I just call it practise! I haven’t read it actually but I’ve had the book for some time, and hence haven’t watched the programme because I like to read these things before I see them. One day I will get round to it! It’s a very long book! Good, though, as was the programme. I loved this! Put me in mind of the tale of the 12 Dancing Princesses…very nicely done! Thanks! Elder Folk are not to be trusted. Really enjoyed reading this. Quite inventive. What a horrible guy. I hope that Garett’s spell works well. I hope so too. The Lord is very powerful but Garrett is very motivated. That’s a whole series. Tolkien would have needed at least 1000 pages. I wouldn’t mind a few hundred more. You really have a feel for this kind of story. Good one!! Especially as I’m rereading the whole Harry Dresden series. I just looked up “Harry Dresden” – it looks like something I would enjoy! I’m glad you liked my story! The word “dance” often brings to my mind faerie rings and the like. Tolkein was quite “wordy”, but a good read all the same! Wonderful, photograph. Great story derived from it, but a horrid way to die, A dance unending. I imagine it’s fun for the first 10 minutes, then torturous for the rest, especially having seen the fate of the other dancers and knowing it will only end in death. I reckon his spell will do the trick. I’m glad you liked it! I do hope you intend to continue this story D-man. I want to see the Lord of the Dance get his comeuppance. I want to see Garett rescue Mirabelle, seeing as he couldn’t save his Jenna. It would be nice to see the spell tear him to shreds, the nasty chap. Well done! I am a very late reader…. been away. But I am trying to catch up! A TV version would be very cool! I’m glad you liked my story (and a possible upcoming TV dramatisation!). Dance Of Death | It's Mayur Remember?